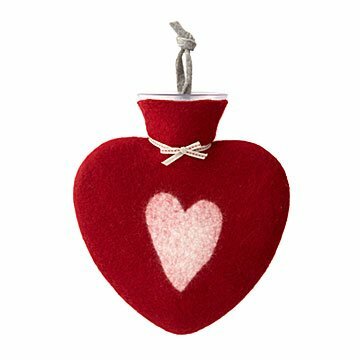 Heart-shaped and covered in handmade wool felt, this premium water bottle is a champion coziness creator. Quilts. Fuzzy slippers. Candles. Hot tea. These are a few of our coziest things. But we'd argue that a good hot water bottle out-cozies them all. Especially this generously sized heart-shaped one, with its soft, handmade Merino wool cover. Pour hot water into the thermoplastic bottle, and slip it under the bedcovers a few minutes before you turn in. No matter how cold the air is, your bed will almost instantly become a sanctuary of toasty bliss, and stay that way for hours. Thrifty green goodness bonus: you'll be able to turn your heat down quite a bit. Wonderful for comforting cramps, sore muscles, and anxiety, too. Made in Germany. The hot water bottles can be washed with inner bottle in the wool wash cycle at lukewarm temperature. The cover can not be removed. Inner water bottles are made of latex free plastic in Germany. Use caution when filling with hot water. Do not use boiling water.